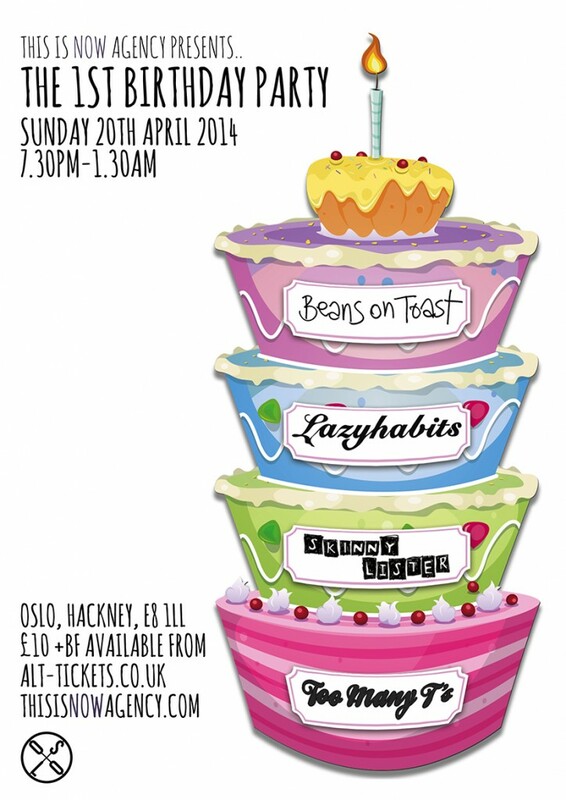 To ring in a successful first year of business This Is Now Agency will be hosting a no holds barred birthday bash at London’s hottest new venue Oslo, in Hackney on Sunday 20th April 2014. Running from 7.30pm – 1.30am, the Easter Sunday blow out will boast intimately rowdy performances from acts handpicked from our world class roster including drunken folk raconteur Beans On Toast, beats and brass band Lazy Habits, full throttle folksters Skinny Lister and the dynamic hip hop duo Too Many T’s. All with busy summers ahead of them, the This Is Now Agency 1st Birthday Party will not only celebrate our success over the last year – which includes Founding Director Adam Gainsborough being nominated as Agent of the Year at the Live Music Business Awards – but will also see some of the upcoming festival season’s hottest acts come together under one roof for one night only. The live sets will be accompanied by a number of special guests who will keep the party going by selecting their favourite new music and honest party tracks to keep you dancing. £10 tickets on sale from www.alt-tickets.co.uk now. 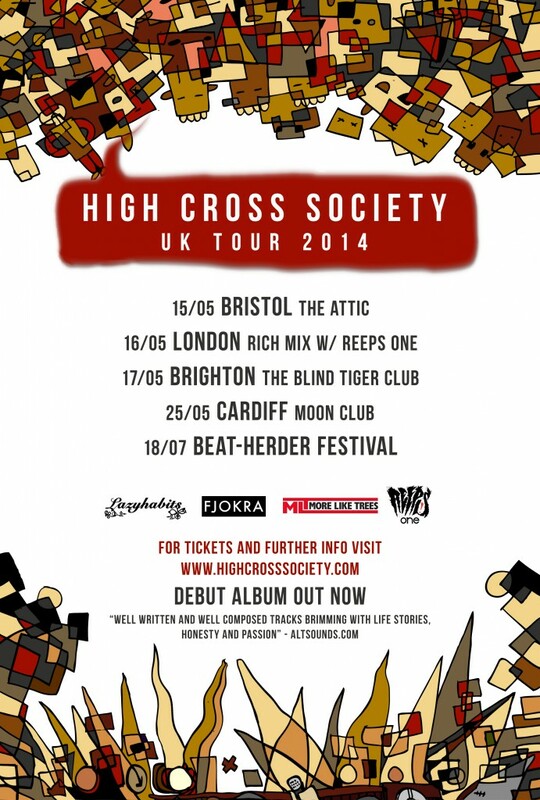 Underground super group High Cross Society will be returning for four live dates this May following the release of their critically acclaimed single ‘Every Time I Look’ and debut self titled album last December. Described by Altsounds as containing “Well written and well composed tracks brimming with life stories, honesty and passion”, the band’s first three live performances as a band were an easy sell out. Now returning with a second string of dates, High Cross Society will revisit The Attic in Bristol on 15 May and The Blind Tiger in Brighton on 17 May for further memorable headline performances as well adding two further venues in London and Cardiff on 16 and 25 May respectively. A lighthouse of originality, High Cross Society represents a meeting of the UK’s finest musical minds under one moniker, including members of bands Lazy Habits, More Like Trees and multi-instrumentalist mastermind Fjokra amongst others. The London show on 16 May will see High Cross Society support UK Beatbox Champion Reeps One at his largest ever headline performance at Shoreditch’s Rich Mix. Further to the May tour dates, High Cross Society will also appear at this year’s Beatherder festival headlining The Smoky Tentacles stage in July and confirming their place as one of the UK’s best kept live shows. As the music industry up sticks to Austin, Texas to attend the Mecca of new music, SXSW, This Is Now is pleased to announce that Public Service Broadcasting will be performing four shows during the week long festival. The band are currently in the midst of their first headline tour of North America, and have been making considerable waves with a sell out show at New York’s Mercury Lounge and recording multiple radio sessions with station’s KCRW, KEXP, WFUV and the world famous NPR amongst others. The band has also featured on NPR’s ‘Austin 100’ – tipping them as one of the best 100 acts to perform next week. Having seen debut album ‘Inform – Educate – Entertain’ being named one of BBC 6 Music’s album’s of the year in 2013, the band are all set for an incredible SXSW, performing as part of BBC Introducing’s showcase at The British Music Embassy on Thursday 13 March from 9pm. The BBC Introducing show will be a full live show performance for the band featuring full live visuals and installations. To get an idea of what to expect from a full Public Service Broadcasting show, you can watch it in action here. Public Service Broadcasting will also perform at a number of day parties including Gypsy Lounge on Wednesday 12 March at 3.13pm, Cherrywood Coffeehouse on Thursday 13 March at 2pm and Blackheart Bar on Friday 14 March at 12.15pm. Joining the band will be This Is Now Agency’s Founding Director Adam Gainsborough as he flies out this weekend to attend the festival. If you see him, make sure you say hello and pick up a copy of the ThisIs Now Agency SXSW 2014 Mixtape, featuring exclusive tracks from our roster. 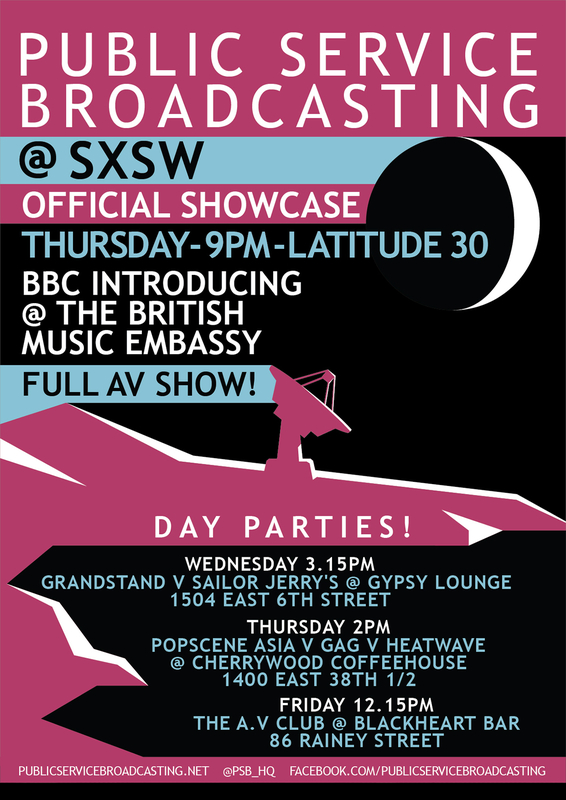 For more information on the Public Service Broadcasting SXSW shows, please visit www.publicservicebroadcasting.net.